When it comes to gathering information, are you a viewer or a reader? There is a sizable minority of individuals who rarely watch television or digital sources to get their information. They prefer reading the news rather than watching it. They say they are more actively engaged with the content in written form rather than a more passive viewing of video news. This group tends to be older than the general population. At the other end of the spectrum are younger generations that receive much of their information digitally and visually through mobile devices. This information often is conveyed through videos. This group is dominated by Millennials and Generation Z between the ages of 15 and 34. In the middle resides a vast number of adults who are comfortable navigating multiple information platforms. They are adjusting to new technology while still watching traditional television news and reading a newspaper. Advertisers need to understand the information consuming habits of the audience they wish to reach in order to choose the right medium to deliver their marketing message. Not too long ago, watching video was limited to those people sitting in front of a television set. Today, video is readily available through TVs, computers, tablets, and smartphones. These advancements have made watching videos on-the-go a regular part of everyday life. Most videos can be shared from one viewer to another and can be viewed on demand multiple times. Videos are more intimate and personal than mere text. Production techniques like voice inflections, camera angles, music, and lighting can drive an emotional response in a viewer. In achieving this type of interaction with a viewer, you start to create a sense of immersion. Video conveys a human voice and personality to a news story or a marketing message. News reports and marketing messages that are driven by images, sound and simple storylines are most effective in a video format. The impact of video is driven by a more emotional and visceral response. Stories or marketing messages that are more complex and require deeper explanation are best told with the written word and graphics. This is true in both print and digital formats. Reading the written word demands more active engagement on the part of the reader as opposed to the more passive viewing of a video. In the hands of a gifted storyteller, the written word can trigger a reader’s imagination. A narrative arc that resonates with the written word has staying power in the mind of the reader. The impact of the written word is driven more by an intellectual and reasoned response. Which storytelling format, written word or video, is right for your marketing message? Finding the balance of the two is essential. 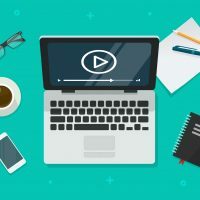 Videos are a great way to introduce yourself to your target audience, but having expanded written content for the audience to learn more about your organization is also critical. A smart combination of these two channels of communication works best to attract your target audience and educate them on your brand’s potential. For more insight, contact Nancy Thrush, Director of Business Development, nthrush@channel-com.com.